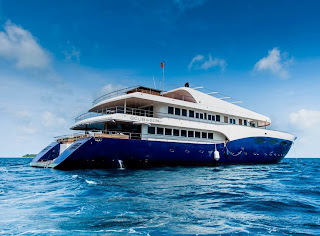 Diving Holidays Worldwide Blog: Maldives: Luxurious Liveaboards - ON SALE! Maldives: Luxurious Liveaboards - ON SALE! Looking to get away before the end of the year to somewhere warm and sunny where you can dive all day and enjoy some world-class dive sites and amazing marine life? We've got three fantastic offers for you, on board some of the best boats around, offering excellent customer service and an action packed week or so of diving. Details on how to book are at the end of the offers below. Diving Rasdhoo, Ari, Mulaku, Thaa and Laamu atolls. Explore a variety of kandus and thilas where sightings of grey reef, white tip sharks, manta and eagle rays are common. For the best night dive, with hunting nurse sharks and huge rays, dive at Vaavu Atoll, then move on to Laamu Atoll for even more exhilaration when whale sharks come for a visit. The stunning coral reefs also shelter smaller creatures including leaf fish and ghost pipefish. Valid on selected trips in October, November and December 2013. Book by 30 September. Saving is on boat only. Dive Worldwide can help arrange your international flights. Some itineraries may require additional domestic flight. Subject to availability at time of booking. These week long exploratory itineraries are full of adventure. Along the journey from the Meemu to Malé Atoll (or vice versa), discover new dive sites and explore world renowned ones. Expect an amazing variety of marine life from tiny critters to large pelagics such as manta rays. Suitable for advanced divers due to challenging but exhilarating drift dives en-route. We recommend a few nights twin centre at Medhufushi Island Resort before or after your liveaboard trip. Valid on selected trips in October 2013. Book by 30 September. Domestic seaplane transfer is required for each itinerary. Subject to availability at time of booking. She departs Malé each Saturday. Alternating a north and south route, she cruises the central region which includes north and south Malé, Ari, Rasdhoo and Baa atolls. Built to offer the discerning traveller a chance to indulge specific experiences, this unique concept offers a week of amazing diving or relaxing spa treatments on board. It’s something many of you have been crying out for! Non-Divers can enjoy the same trip on a yoga package. What a way to unwind! Valid on selected trips in September 2013. Book by 06 September. Offers are subject to availability at time of booking. Terms and conditions apply.